Yesterday, I came to work to discover that one of the young artists on our story crew had collapsed in his cubicle and died the night before. Justin Wright was 27, and a happy, energetic, and talented guy. I can't say he was my friend as I barely knew him on a personal level. We had talked about music a bit, shared some cd's, had some amiable debates about the aesthetics of video games (about which he clearly had strong opinions). I watched him give a story pitch a few weeks ago, and was really entertained by his timing, drawing prowess, and ability to stage shots and blend humor and action... He was a talented young artist who was just digging into his work. I think explains not only the reason for Justin's short time on Earth, but why he was happy to be alive. Anyone, any age, can learn from this. Life is short for all of us. Tragically short for some. Fortunately, Justin lived long enough to realize his desire to work as a story artist at a studio he admired. Some of his dreams came true. My heart goes out to his family and friends, as well as his colleagues here at work who will miss his spirit and contribution to their lives. Nor do they go away. Just like today. I've been trying to get out and paint, and the weather is making it tougher on the weekends. Over many summers, I 've spent a few days in a remote corner of British Columbia, ostensibly on a fly-fishing trip, yet I generally end up painting. (I would not call myself a fisherman) The weather up there can be quite varied every year, and I've grown accustomed to continuous drifts of clouds, and the periodic rainstorms that come with the territory. What I have observed up there is that the clouds seem to move slower, or perhaps it is just my imagination. Regardless, clouds figure into the equation, unless I'm painting portraits of fish that have been caught by my in-laws, nephews, and my son. From that locale, I've learned to paint from a boat, correcting my view periodically with the oars. 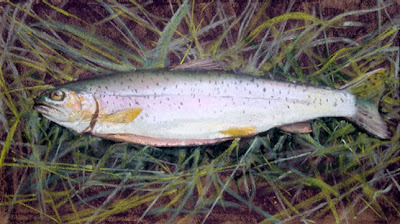 I have even painted in a boat while another was fishing, Such was the case with the image below. My brother-in-law Bob was dry fly fishing in the shallows as I worked away. To each his own, and it is nice to have company from time to time. There's a common ground between painting and fishing, which I shall restrain myself from elaborating on. 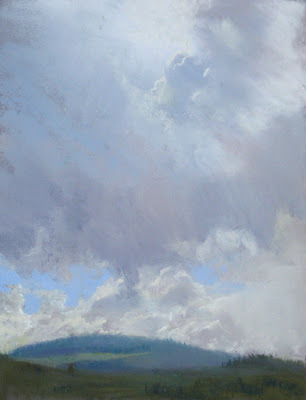 Here's two pieces I painted for the Sonoma Plein Air show last September. As I mentioned in an earlier post, I often go looking for long, atmospheric views with a few elements in the mid, or foreground, but I periodically find something far more intimate along the way that stops me in my tracks. Rocks, for their patterns and local colors, as well as how they receive light, can do that, as well as looking into shadows, or painting from within a shadow. The human eye and mind grasps a wide range of color within a wide range of value... far better than a camera can without some manipulation. Part of the pleasure in painting lies in exploring that range. There's something profound and unusual about how we perceive objects in light and shadow. For one, an object that is seen under both conditions tells you more about its form and local color than if it was only subject to one condition. In addition, there is a paradox, that has to do with how we recognize that an object, or image, is 'one' thing when a shadow can effectively divide it into 'two' things. The act of painting makes this division evident. The perceived continuity of form and color transiting light and shadow is a cognitive miracle that many take for granted, whether we are looking at something real, or a painting. A persistent challenge in painting is to propagate that illusion, when the physical process of the medium implies the opposite! And lastly, seeing into shadows has a way of enhancing depth in an image. The eye is not stopped by a shadow, unless it is black. Instead, the eye crosses a threshold of sorts to look inside that dimmer volume, illuminated by ambient sources and colors. The same gain in depth applies when looking from a shadowed space into light, an effect that has been used for centuries. The behavior of color, subjected to light and shadow, is really an extraordinary event, I promise you! I had been intently studying mailboxes, and eucalyptus trunks lining one side of the road I was on, when the clouds drifting across the sky behind me started calling, along with the blue mountains, and a nice arrangement of trees and houses to sort out. On the film 'Cars', I was very inspired by Maynard Dixon's work, and freely adapted his playful cloud shapes he used so effectively. That afternoon's sky was a natural expression of those same qualities that Dixon drew from. I spent most of my time fussing with the tree and building proportions, as well as getting their edges to pop against the distant mountains. By the time I got to the clouds, they had exited stage right. Fortunately, I had done a thumbnail, sticking them where they seemed to do the most good. 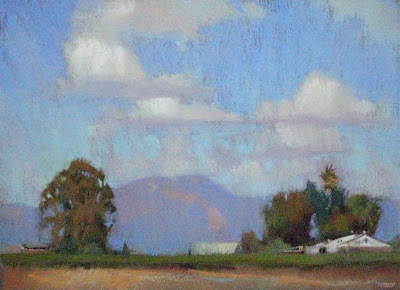 This was painted on a driveway in Glen Ellen a few years back for one of the weeklong plein air events. 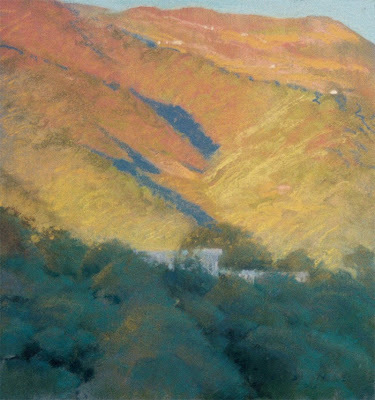 I had been painting for a few days, and driving back to the house, I kept noticing that the view on the opposite side of the valley made a striking light and shadow pattern in what appeared to be a steep canyon. I checked the time that I could see this arrangement and made plans to be ready to paint it on one of my remaining days as a guest on that property. A few days later, I got back early enough, and hiked up the drive to the spot and set to work. The zig zag shadow pattern was already prominent, and the foreground soon went into shadow, which I desired. The color range of the hillside kept getting warmer and warmer, completely departing from a sense of green, into a range of yellow and ruddy hues. The blue shadow in the canyon was a jagged slash. The whole image was more like a graphic travel poster in its simplicity. I settled in, working on the sunlit regions, as they were going to be swallowed up inevitably by the shadow that would be crawling up the mountain. This post is titled 'wild turkeys abundant' for a good reason. They were. I had wandered about the property a few times before painting this, and had found more turkey feathers than I cared to pick up. After about 10 of them, the next 50 one can see within a few yards become less intriguing. But I had only found feathers, not turkeys. However, as I set to work on this piece, the turkeys, whose castoff clothes littered the grounds, appeared at the head of the driveway, up the hill to my left. Once they spotted me, they gathered in a flock a few hundred feet away and held a noisy debate. Their course of action determined, they slowly advanced down the drive towards me, the whole time scolding, and cooing away, before angling off the road behind me up into the oak forest, . They moved in halting, jerking steps, and were inclined to march single file, thereby creating a lengthy procession of bickering plumage in my peripheral vision. After awhile, I could hear their wings flapping behind me as they, one by one, flew into their roosting tree, and settled down for the evening. I was greatly entertained by this 'fowl drama' unfolding around me as I worked. Sit still in a forest, and you never know what critters will come around, minding their own business, to find you standing in their way. 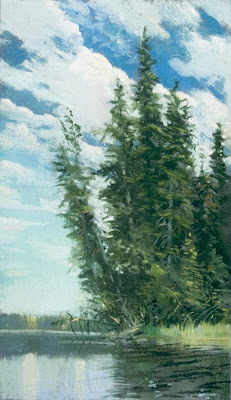 The last area of the painting I worked on was the foreground shadowed trees. Once I focussed on them, I could see temperature and value shifts in their canopies that I hadn't noticed before, as I tried to separate the mass of trees with those variables. It was that jagged slash across the valley that made me want to paint, but it is the turkeys marching off to bed that I will always remember this image by.